The process to demolish and dispose of the highly contaminated Plutonium Finishing Plant (PFP) complex on the Hanford site began more than 20 years ago. Open-air demolition on the plant began in late 2016 using heavy equipment to tear down its walls. Work at the plant has been stopped since Dec. 2017, after high winds caused widespread distribution of airborne contaminants, including plutonium and americium. Current status of demolition activities and efforts to contain and track the spread of contamination at the finishing plant can also be found on U.S. Dept. of Energy's Hanford website. The state Department of Health's website includes information about air quality and oversight of releases of radiation at the Hanford site. Mar. 22 - After the December spread of contamination, 281 Hanford workers were tested for radiation doses. The final results of worker blood tests found 11 had inhaled or ingested radioactive particles, although state experts considered the amounts found to be too small to pose a health risk. We do not know if the spread of contamination has been controlled. 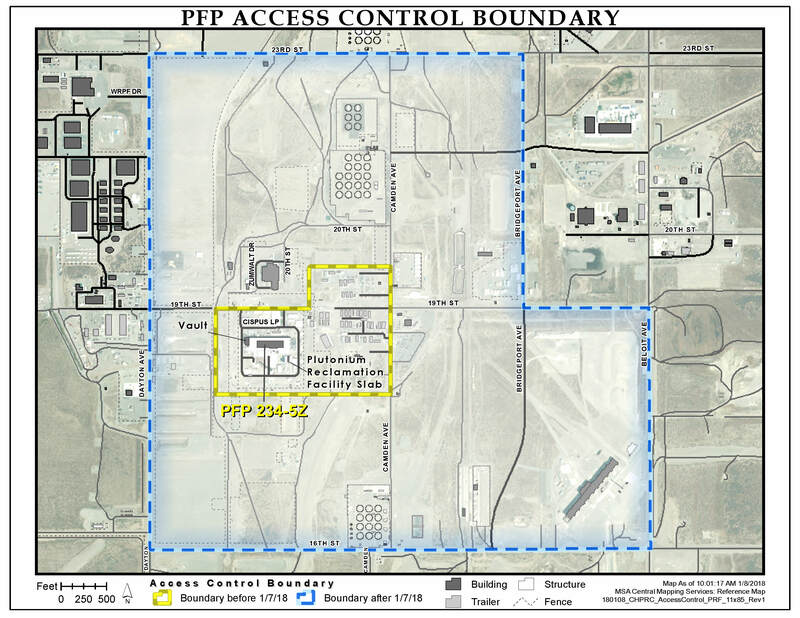 Contamination has been detected by state air monitors as far as 10 miles from the PFP demolition site. We continue to receive reports and news from other sources saying that contamination has been found in air filters in worker's cars, both inside and outside of the expanding demolition zone at Hanford. Some of the toxic airborne contaminants from the buildings have been ingested by workers. Jan. 30 - Washington State Department of Health issued a letter to the U.S. Department of Energy to formally express its concerns. The Health Department included its findings from air samples taken at and around the Hanford site, and the results of blood tests that had been requested by hundreds of concerned Hanford workers. The letter included a bulleted list of requests, many of which we had previously requested from Energy. Jan. 29 - Energy ordered a change in project management of PFP demolition and recovery activities, from CH2M HILL Plateau Remediation Company (CHPRC) to its parent company, Jacobs Engineering Group. Jan. 9 - Today we sent a letter to the U.S. Department of Energy that we won’t allow work to continue on demolition of Hanford’s PFP until we’re certain that the work can continue safely without threat to workers, the public or the environment. The U.S. Environmental Protection Agency joined us in this directive. The stop-work order was issued based on Article 32 of the Tri-Party Agreement, a legal agreement signed by our agency, the U.S. Department of Energy and the U.S. Environmental Protection Agency. Article 32 gives any of the agencies the authority to stop work if they determine that the work endangers the health and safety of workers or the public. Under the complex web of laws, regulations and legal agreements that govern Hanford, the Department of Energy is largely self-regulating on the project to demolish and dispose of the PFP infrastructure. However, we have some oversight responsibility, as does the EPA. At a presentation by Energy at the Hanford Advisory Board committee meeting, the speaker indicated that seven worker vehicles and 16 government or contractor vehicles were contaminated with specks of plutonium, and at least 269 Hanford workers have requested blood tests, or bioassays. Energy says it has taken many measures to secure the contamination at the Hanford site. Dec. 17 - Work was stopped later in the day on Dec. 17 when the contractor, CHPRC, was notified of the earlier contamination found. Meanwhile, workers have applied fixatives to try to keep more radioactive materials from spreading in the wind. Dec. 16 - Debris left from demolition of the Plutonium Reclamation Facility was covered with dirt and glue-like fixative. Still, new surveys found contamination on the hoods of cars and all around the mobile office trailers. In addition, a number of employees had driven home, potentially tracking radioactive contamination off the Hanford site and potentially into the workers’ homes. The workers continued with demolition at the PFP buildings. Dec. 15 - Workers found contamination at an air monitor outside the established control area. Subsequent monitoring found contamination on the hood of a vehicle, a concrete barrier, near mobile office trailers including on the stairs of one, and on a dumpster near an office trailer. Work continued at the PFP complex. Dec. 14 - We were notified by the U.S. Department of Energy that work had been stopped because air samplers worn by workers showed elevated radiation levels. The elevated readings occurred on Dec. 8, 9 and 12. Work resumed later that day after no further contamination was detected. June 8 - Contamination was first detected by air monitors during demolition of the remaining two, highly contaminated central processing facilities at the PFP complex. After the initial spread of contamination at the plant, 31 Hanford workers tested positive for exposure to contamination. The majority of those had doses below 0.5 millirem. For comparison, the average U.S. resident is exposed to about 300 millirem a year from natural sources. Plutonium and americium contamination was detected at PFP in summer 2017. Work resumed when it appeared that no additional contamination was coming from the facilities. However, when the reclamation facility was knocked down to its foundation in December, there was a widespread release of plutonium and americium. We’re extremely concerned about recent releases of highly radioactive particles from the plant. Not only have these particles spread far beyond the containment zone established by the Department of Energy, but they posed a risk that contamination could be carried off-site by workers’ vehicles. We’re not convinced that Energy has adequate safeguards or monitoring in place to ensure safe operations. After major releases of contamination last summer and again in December, work was allowed to continue. The result was an even more widespread release. This clearly is unacceptable for worker and public health and safety, and threatens other nearby clean-up operations. We will insist on reviewing Energy’s plan to resume work, to ensure that it includes adequate protections such as the establishment of containment zones within which heightened safety measures are deployed, and the calibration and placement of monitors intended to signal contamination releases above acceptable regulatory limits. If work resumes before we’ve given the green light, we will issue a stop-work order. We’ll lift that order only when we’re persuaded that Energy has an acceptable work plan in place, and that it is committed to carefully following that plan. The PFP was a complex of more than 60 buildings on the Hanford site. The buildings collectively worked to convert irradiated fuel rods from Hanford’s nine nuclear reactors into pucks of pure plutonium, which were used in the nation’s nuclear weapons arsenal. PFP demolition has been in process for more than 20 years. Current work is on the last two buildings, which together constituted the central processing complex. Those buildings are the main PFP processing building and an associated plant, the Plutonium Reclamation Facility. Together they were some of the most contaminated buildings on the entire Hanford site.